Second allergy attack of the season has slowed me down this week. Nevertheless I've managed to stitch up some bits and pieces of a couple of projects. All of the white squares for "Twist of Lime" are finished and I'm making headway on the gray squares with black centers. Once I get the gray squares done, this project will go back in the box until a retreat later this summer where I will have a design wall large enough to accommodate laying out and arranging the blocks. I've set myself a goal of 4-5 string blocks every day -- 20 finished this week! I've been working on these after dinner while watching "500 Questions." Anybody else hooked on that program? I sure hope they keep it going. And, finally, I've pulled out what I should be working on -- prepping for "Japanese Star" which I'll be teaching next Saturday at the Covered Bridge Quilt Guild in Princeton, IL. Lots of errands on the schedule today. I'd better get crackin'. Monday was a rainy day, a good day to catch up after a busy weekend -- a turnaround trip to East TN on Friday, setting up handbells on Saturday, early practice and performance at the Sunday service. I needed to get my quilting mojo back. But I wasn't yet in the mood to start prepping for the upcoming classes I'll be teaching in Illinois. Instead, I turned to an easy pattern I'm doing for Son-2 and DIL called "Twist of Lime" (Fons & Porter's Quilting Quickly May/June 2015) using fabrics I picked up in Paducah. The light gray squares will have black in the center and the intersections of the light gray and white squares will have lime green squares. Because of the wide variety of greens I have, I'm thinking I should keep those green corners matching, also. Which means I need to lay everything out before I can add the green flip'n'sew corners. Once I work out the details it will be mindless sewing that I can pick up when I get a few minutes or run through as leaders-enders on what I should really be working on -- class samples and step-outs. OK, so I exaggerate ... a bit ... but it was so heartwarming to meet a blog reader in an unexpected way. Friday was a beautiful day for a drive to Maryville in East Tennessee to attend a meeting of the Tennessee Regional Quilt Study Group held in conjunction with the Smoky Mountain Quilt Show. At the morning antique quilt bed turning the speaker greeted me by name as she walked down the aisle. From behind me a little voice said, "Are you Libby, the blogger?" That is how I met Kathie W, who likes to follow blogs of Tennessee quilters. We had a nice chat before the program began and it was a thrill to learn she was a prize winner! Blue ribbon first prize in the "Other Techniques" category (because it was a block of the month -- design by Vicki Bellino of Bloom Creek Quilts). Piecing and applique AND hand quilted! Congratulations, Kathie on your win; well deserved. The show is one of the longest-running annual shows in the area -- 35 years! Even though it's an area show, they had entries from 13 other states as well as Norway and the Netherlands. Great variety with several special exhibits. I will definitely go again next year. ... and 1 yard of a dark red I thought would work as an inner border on my Classic 4-Patch. However, I have decided not to use an inner border and just let the border print do the talking. I'm making headway in my attempts to balance my stash numbers! Remembering my 2015 Resolution to FINISH!, I could not, in good conscience, leave the remaining trapezoids in the 3-inch braid box. Since I did not use all the completed braids in Sunflower Braid, I decided to make additional braids and see if I had enough to build more than a wall hanging. The difference this time being I will not stencil the separating strips. Instead I have cut lengthwise strips of this sunflower print. I think the end result will be quite striking. And it should make a nice twin size quilt. I got to thinking -- that's a dangerous thing -- thinking about other braid quilts and how pretty they would be in more colorful fabrics and, and, and .... before I could think twice I had cut all my existing 3" strips into braid trapezoids. Hence, the giveaway. To the first two U.S. readers who ask, I will split what I have already cut. It won't be enough for a whole quilt, but it will get you started and give you some variety to your stash. I will include instructions for cutting from 3" strips using an Easy Angle ruler. The rest of the week will be devoted to cleanup and recovery from the last few weeks of frantic activity in the sewing room. I will be heading to Maryville on Friday for a Tennessee Regional Quilt Study Group meeting at the Smoky Mountain Quilt Show. Of course, I can't go to Maryville without a visit to Pappy's. I have two fabric pieces I specifically need. Hoping I won't be tempted beyond that! To see what other quilters are working on this week, hop over to Patchwork Times. Here's a quick pic. Hoping to get a better photo at the guild lecture today. I posted about the process yesterday and I wanted to clarify one point. It is possible to use other types of products like fabric paints rather than pigment inks. I prefer the inks because they dry quickly and soft, can be stitched through, and clean up with soap and water. Plus I like the soft shading I get with them. I'm linking up with Connie at Free Motion by the River for her Linky Tuesday Party. Check it out! I am giving a talk tomorrow on antique stenciled quilts. 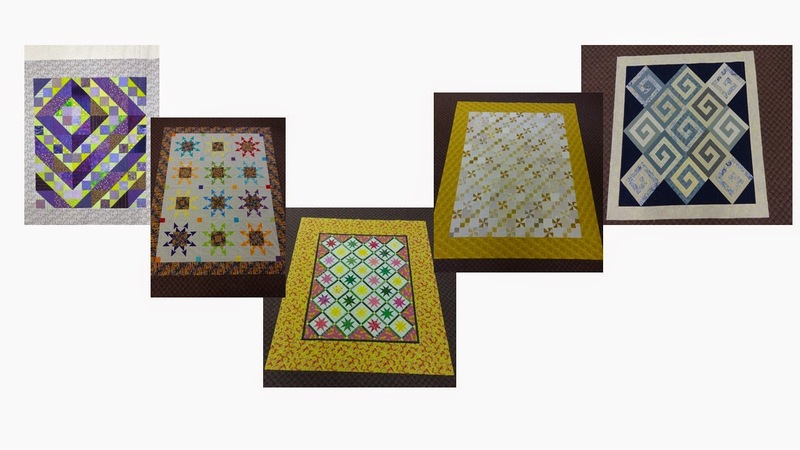 Since there are very few extant examples, and none in my collection, I decided to make an example to show ... cause you know how quilters like to look at quilts! My inspiration was a quilt on the cover of Quilter's Newsletter Magazine, July/August 2005. This quilt (not mine) hanging at Mountain QuiltFest in Pigeon Forge, TN was made from the magazine pattern. Rather than applique the flower vines, however, my plan was to stencil them. I made the yellow braids about 10 years ago, but it has taken me this long to screw up the courage to attempt the stenciling. And since I am now facing a critical deadline, the quilt project has turned into a small wall hanging. Once I had replaced the pigment inks that had dried up over time, I was able to get started. The sunflower stencil I chose is about 5" wide so I cut my strips 6-1/2". I used a Kona cotton, washed without fabric softener. I stabilized the strips with freezer paper on the back. I taped the stencil to the fabric. The pigment inks I use are manufactured by Tsukineko. The product names have changed over time; the most recent ones I purchased are MementoLuxe. There are a lot of stamp pad products out there that look similar. It must be a pigment ink, made for fabric as well as other surfaces. The inks can be applied with a variety of tools, depending on the size of the stencil openings. Yes, those are cosmetic applicators and sponges, along with daubers and sticks made to use with the inks. I found the small stencil brushes to be the best for my chosen stencil. Ink is applied by brushing or rubbing from the stencil surface into the open area. The initial effect is relatively light. Shading is accomplished by increasing pressure if rubbing or adding additional ink around the edges if brushing. The finished product is heat set with an iron. I decided the sunflowers showed up better so I made two more of those. Check back tomorrow to see the finished wall hanging. In the meantime, hop by Patchwork Times to see what others are working on. Five finishes this week! You can get a better look at the quilt tops here. The impact on my stash? Twenty-one yards out! 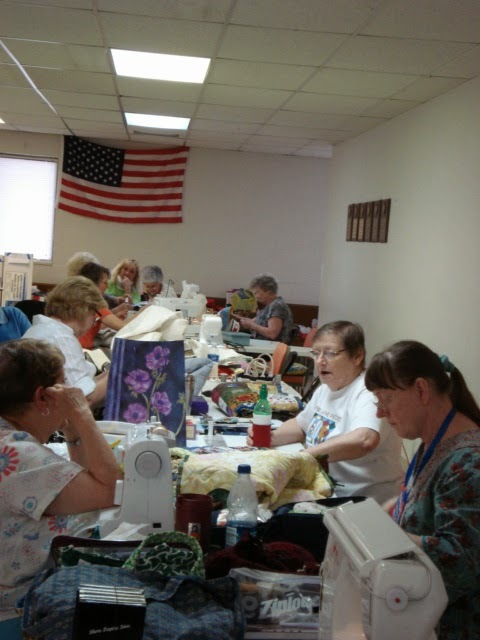 Linking up with others at Patchwork Times. While I was at retreat last week, we had to have a pressure reducer valve added to our incoming water line at home. The plumber who installed it noticed that the faucet at one of the sinks in the Queen Mother suite was leaking and needed to be replaced. Since we're planning to sell soon, we might as well replace both sink faucets in that bathroom so they match. And, as long as the plumber is going to be here, let's get a new faucet for the powder room to replace the 90s brass fixture that is corroded. That's on today's ToDo list. Then, yesterday I wanted to microwave popcorn to munch on while watching the golf tournament. I tried one packet; it didn't pop. Maybe it was out of date -- nope. I tried a second packet for a longer time. Nothing. I tried boiling water with the Quick Minute. Tepid. I tried boiling water by setting the timer. The outside of the microwave was hot, the Pyrex measuring cup was hot, the water was tepid. That microwave wasn't even two years old! The Main Man returned from the appliance store with a new one, This time he purchased the extended warranty! Although I did not re-up in guild this year for a variety of personal reasons, they thoughtfully included me in their Spring retreat. As I've said before, I save finishes, especially larger ones, for a retreat where there will be large tables to lay out and measure and pin long seams, etc. So, many of these projects were close to done before I arrived on Tuesday afternoon. Since it was on top of the pile, I attacked Lavender and Lime Mary's Triangles first. All it needed was a border to become a finished flimsy. It's a small lap or crib size. 3 yards out. Next I arranged all the Butterscotch pieces and parts on a design wall. With a few replacements here and there, I came up with a layout I could live with. So I took the rows down, pinned and numbered, before the AC blew them down overnight. Assembling the rows became my leader/ender (L/E) project as I was working on other things. Next up was Wink & a Smile, a class sample that needed a border. Another quick finish. 4.25 yards out. It was time to get out Classic 4-Patch. All the rows had been assembled and numbered at home; the two corners were complete. It was just an exercise in stitching the remaining long rows together and adding corner triangles. However the inner border fabric I had selected was not "playing well" with the rest of the quilt, so I was not able to finish it. I did get the "Women of Courage" border print cut for the borders on C4P, but I can't claim a finish on this one, yet. Happy Talk required a little more work. At home I had made some tactical mistakes in attaching the long sashing strips, and without any notes to work from, it took me a while to figure out where I was going. It did not help that I attached the longest row without offsetting the blocks to accommodate the on-point setting and had to reverse sew. Happy Talk is a finished flimsy and has already been gifted to a friend who admired it (and who has a longarm to quilt it). 6 yards out. Needless to say, I got a lot of Butterscotch rows together in between finagling with Classic 4-Patch and Happy Talk! It was time to finish assembly, add borders, and call it done. This, too, has been gifted to another friend who admired it. 5.25 yards out. With time left in the day I pulled out the two small Athena's Puzzles I had not finished at the snowy February retreat. I added setting triangles and borders to the blue one. I didn't have enough of the proper fabrics to finish the orange one so it's back in the box. Athena Blue is a nice wheelchair size. 2.5 yards out. A total of 21 yards in the "used" column. I'd say, all-in-all, it was a successful retreat!! Check out what others are celebrating at Confessions of a Fabric Addict. This project has been lanquishing for 10 years! In 2005 I attended a class at the Indiana Heritage Quilt Show with Debbie Caffrey where she taught many (if not most) of her Power Cutting techniques. I was especially intrigued by her demonstration of cutting trapezoids (however, 10 years later I'll have to review the book to remember how I did it). Anyway, cutting trapezoids for braid is less wasteful than cutting strips -- no ends to trim off! Apparently in my "yellow period," I cut up everything yellow and close to yellow. I still have a box full of yellow trapezoids, even after making 8 strips. Inspired by the cover of a magazine that had yellow braid separated by appliqued flower chains, I plan to stencil flowers on my version. I've hit a stumbling block, however, as my stencil inks have dried out in the years that they stood idle in a box. So first item on today's agenda is to hit every hobby/craft store in the area to find replacements in suitable colors. As I work my way through this project I will post updates on the process, so stay tuned. I had no finishes last week, but continued to make progress on my 6-1/2" neutral string blocks. I still have no plan for these; I've been mulling a few options, but would appreciate suggestions. I've pretty much worked through the longer strings in the cream/beige colors. I cut my papers at 6-1/2" because that was the size of the ruler handy at the time, plus it pretty much used a whole sheet out of a small phone book. It takes a strip at least 9" to go across the diagonal at this size and most of my strings are a lot shorter. I think the next time I start something like this I'll cut smaller papers as the base. Lesson learned. Even though there was nothing I could count out of the stash, I do have an adjustment to my report. I underestimated my extended arm measuring technique and discovered I had actually purchased 3 yards less in Paducah! Heading out to a guild retreat tomorrow; a stack of finishes awaits. First up will be to put Butterscotch on the design wall where I can cogitate on the arrangement of blocks and make the remaining pinwheel blocks as leaders and enders while I assemble and add borders to Classic 4-Patch, Happy Talk, and the remaining Athena's Puzzles. Check what others are working on at Patchwork Times. It was the first Friday in May, the first day of our guild quilt show, and it rained off and on during the day. As show chairperson, I wanted to go early and stay till the end of the day. It was still raining when I drove the 35 miles home. Two guild members stayed overnight to provide security for the quilts. Fortunately, when the church gymnasium roof started to leak, they were able to strategically relocate some quilt racks and place trash cans to contain the rainwater. On my way back to the show Saturday morning I noticed the gutters along the highway were overflowing. It poured all day. By 2 p.m. we were getting reports of minor flooding in a few areas of the county. When it was time to close the show, there was a break in the weather. With much coordination and fast action, we got the quilts down, distributed to their owners, and racks loaded into trucks and vans in 30 minutes! The first indication I was in trouble was when I had to turn around on the interstate because a big truck had wrecked in ponding water. I chose an alternate route, but had to turn back because the Harpeth River was over the road. With constant cell calls to my husband I was able to find my way back to the interstate beyond the wreck and made it all the way to our subdivision -- only to find water raging over the road to our side of the Little Harpeth River. Our house on the hill was not affected, but I spent two nights in a motel as the rain continued through Sunday. Seventeen inches in two days. Much of downtown Nashville was underwater. Many other low-lying pockets were flooded, including areas of the county where the quilt guild is located. 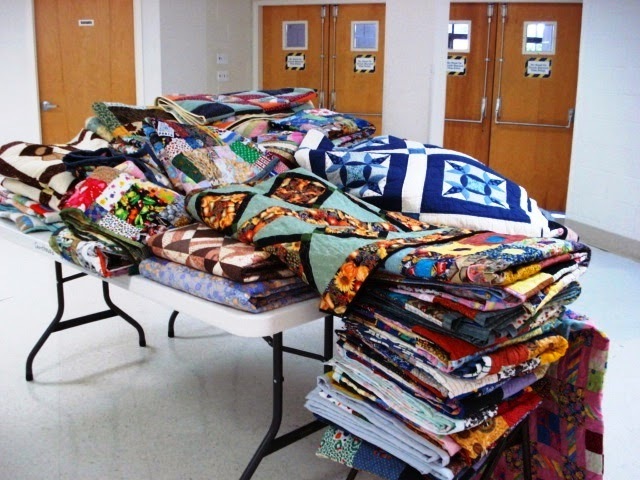 What do quilters do in a disaster? We make quilts. The quild gathered on a couple of Saturdays following the flood and worked, assembly-line style, to finish quilt tops, cut backs and batting, and doling everything out to be quilted or tied. Ultimately we produced 140 quilts. Several guild members were directly affected by the flood. They needed quilts for themselves and their neighbors. We distributed the quilts directly to people we knew would appreciate them for the love that went into them. So many people were affectd by this 500-year event. Nashville took care of itself, we have recovered, we are stronger, and there are plans to build a flood wall so it won't happen again.